After a gruelling fourteen day trial, a group of activists known as the Thales Ten,* received their verdict in Glasgow Sheriff Court last week. Five were convicted, and five acquitted, of the crime of breach of the peace. 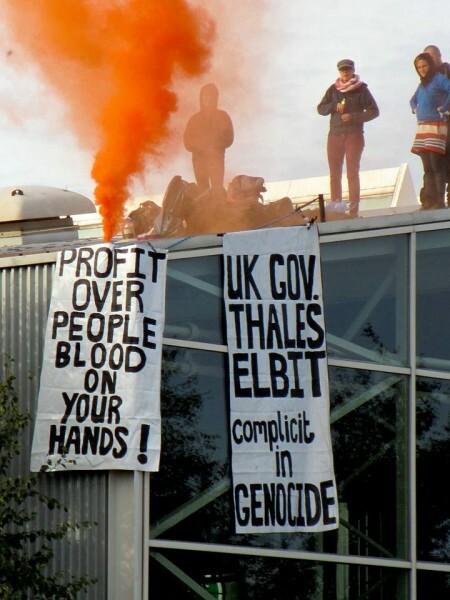 The group scaled onto the roof and blockaded entrances to the Thales UK factory on 23rd September, 2014 in response to the war in Gaza. They hung a fifty foot Palestine flag and several banners. One read: ‘Another Scotland is Possible: Stop Arming Israel’. Another made the connection between the French arms company Thales, Israel’s Elbit Systems, and the UK Ministry of Defence. The UK Government and the French and Israeli arms giants are cooperating over the delivery of the next generation of Watchkeeper drones. This evolution in unmanned aerial warfare will replace the Hermes drone, which has been used to deadly effect all over the world, notably in Afghanistan, Pakistan, Yemen and Palestine. A common sight over the skies of the Gaza Strip, drones are frequently used by the Israeli occupation forces to survey and launch deadly attacks against Palestinians. Human Rights Watch documented 87 killings through drone strikes on the Gaza Strip during the Israeli named ‘Operation Cast Lead’ in 2008-9. In a major victory for Palestine activists against the arms industry, a member of Thales senior management was summoned by the Scottish courts to answer questions as to the nature of their business. Activists cross-examined a Senior Manager of Thales UK, Ian Lindsay, in their defence. Mr Lindsay admitted that components manufactured on the Clyde in Glasgow are used in military drones. This is a major admission for a number of reasons. The local community regard Thales as highly secretive as to what is manufactured in the plant. This is significant because in addition to a long history of weaponry and munitions manufactured on the Clyde, there is also a history of resistance. In 1974, Scottish workers at Rolls Royce plant in East Kilbride refused to service engines bound for Pinochet’s coup of Salvador Allende. An act that later saw Bob Fulton, John Keenan and Robert Somervilleawarded the highest honour by the Chilean Government. It is also significant because it is rare that arms companies are called to face the courts as to the nature and legality of their business. In August, 2014, nine Palestine activists shut down a subsidiary, Elbit, UAV Engines Ltd. in Shenstone, England. Despite being charged with aggravated trespass, the Crown Prosecution Service dropped the case. It is widely believed that this was due to external pressure to avoid the arms companies being called upon to speak to the nature and legalities of their business. According to their own trade regulations, the UK is not allowed to sell arms to countries that violate international law. Concerning arms sales, criterion six of the Consolidated EU and National Export Licensing Criteria compels the British government to take into account the buyer’s respect for international law. The United Nations mandated Goldstone Report, investigating the conduct of the belligerents during ‘Operation Cast Lead’, contained damning evidence of Israel’s violations of international law. In a Ministerial Statement on 21 April 2009, then Foreign and Commonwealth Secretary David Miliband admitted that Israeli equipment used in Gaza in the 2008-9 conflict “almost certainly” contained UK-supplied components. One of the ways the UK government circumnavigates its own trade restrictions on arms is by selling components of weapons to be assembled into deadly weapons in other countries. It is believed that the CPS dropped the Shenstone case is because activists were arrested for aggravated trespass, a charge which is based on the disruption of “lawful activity”. Had the case gone to trial, the nature legality of UAV Engines’s business would have been put under the microscope in a court of law. Something the British Government has a clear interest in preventing. In the case of the Thales Ten, activists could not probe the legality of Thales business. The alleged crime was the breach of the peace (which does not exist in England): the only requirement for a conviction is the probability that fear and alarm could be caused to an individual, or that a serious community disturbance is likely. Delving into the legality of Thales business was deemed irrelevant to the case. However, activists were able to establish a clear link in court between Thales, Elbit Systems and the MOD, and also drone components manufactured in Scotland, and alleged war crimes in Gaza. The arms industry in Israel and its connection to Western economies is a major driver and sustaining force in the occupation, colonial and apartheid conditions in Palestine. The question for activists in Scotland (and across the UK) is given the Scottish Government’s stance regarding an arms embargo on Israel, is how can this be progressively exploited? Under the Scotland Act, trade is devolved to Westminster, however, with the political climate so charged for change, what more can be achieved towards justice for Palestine? * The Thales Ten are members of Glasgow Palestine Action, a women, queer and trans*-led group, organizing and taking action against Israeli apartheid through boycott, divestment, sanctions, and other solidarity work. Scotland. Please do not lend your support to the continuing murderous treatment of what remains of the poor, impoverished, Palestinian people, who have been, and still are being driven into ever decreasing zones, surrounded by concrete and imprisoning fencing, into Concentration Camp Condiditions, with little or no water, electricity, health treatment or even adequate provisions and cruelly controlled by Gestapo type forces, with anyone showing any resistance to the barbaric treatment, being summarily imprisoned without trial for years and years no matter what ages, very young to very old. Free the Palestinians. Please! For the Palestinians to be free they would also have be rid of the cancerous and murderous Islamists of Hamas. And Israel, I’m afraid, will not care one iota if the UK or Europe freezes arms supplies as they make their own and export them (ie the Uzi sub=machine gun). Yes, I would like to see an independent, sovereign Palestine but we should be aware that the state that we seek to see will almost certainly not be a free entity. It will be run by the Islamist clerical far-right. Name all the leaders of these so-called “Palestinians”, their titles, dates of governance, and from where they governed. What was the currency? Name the outside sources which refer to this place? Romans called it ” Palestine” based on the Jews’ old enemies. No relation to present-day Arabs calling themselves such. It was called “Canaan” before Jewish rule. “Palestine” was ruled by Jewish vassal kings (the “Herod’s”) as well as the Macabees (Judah, and brothers). You’re rather short on facts and figures.